The opportunities for jobs involving the ocean are wide and varied, and preparation makes them within reach. When most people think of a career at sea, they may envision a Marine Biologist watching whales, a Captain piloting a large cargo ship, or a scuba diver studying reefs. In reality, there are hundreds of different careers at sea. On research vessel Falkor alone there are deckhands, stewards, chefs, bosons, engineers, fitters, officers, pursers, marine technicians, scientists, and more. Classes in school are often the first steps people take in pursing their dream job. Studying sciences and math – chemistry, biology, physics, calculus, etc. is essential to pursuing marine sciences and engineering. It is good to have an idea of what you would like to specialize in, but also important to have wide-ranging foundation of understanding. Trade and vocational schooling can also open doors to jobs on ships. Internships and student opportunities help students get first-hand experience and exposure to a variety of careers. No one claims that working on a ship is easy. Long hours and hard work are the rules, not the exceptions. However, many people are drawn to careers on ships for the chance to travel, long stretches of time off, and the chance to participate in unique work. In order to excel, a person needs to have a sense of adventure, good problem solving skills (there are limited resources when one is miles from land), and be able to work well with others (it is tight quarters on a ship). Being determined, curious, and eager to learn are important traits. Curiosity led Colleen Peters, one of Falkor’s Lead Marine Technician, to study marine sciences and continue exploring possibilities to find a job that would fulfill her the most. “I like to understand how things work. Troubleshooting is a big part of my job—if something breaks you have to figure out why and how to fix it.” Determination will also help you find a job you love. Put forth the effort to ask for advice and ask about opportunities such as internships or volunteering. What do you do: Lars is in charge of all the deckhands on Falkor and keeps operations that take place on the aft (back) deck running smoothly. How did you start: Lars got started in the German Navy where he spent two years as an electrician. Following his time in the navy, Lars sold electrical supplies for eight years. Unfortunately, this put him behind a desk and he wanted back in the action. He first became the Bosun on a tall sailing ship, and three years later made his way onto Falkor. Lars has now spent the last seven years working at sea. Advice: Lars recommends that those aspiring to work on a ship as a deckhand or engineer should attend a trade academy to learn a skill, and then apply for a job. What do you do: Stian works to make sure all the science cruises are organized and planned, working with both the crew on Falkor and the science teams. How did you start: Stian was obsessed with SCUBA diving as a kid. He loved to free dive and learned to SCUBA at the age of 13. After finishing high school, he studied marine biology in college and graduate school. 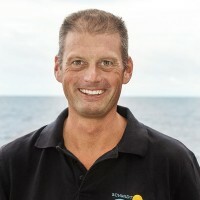 Stian worked as a SCUBA instructor, laboratory manager, and sub-tidal research biologist (working underwater in kelp forests and on small research boats), before joining the United States Antarctic Program as a marine technician on their research vessels. Fifteen years and several vessels later, he now gets to work both in the field and in the office, where he provides remote support to the technicians sailing on the Falkor. Fun fact: Stian once got stuck in the ice for a month on an icebreaker in Antarctica. What do you do: As a deckhand, Archel helps with various science operations such as deploying robotic vehicles and CTDs, as well as assisting with the day-to-day operation such as looking after lines used to moor the ship, and general ship maintenance. 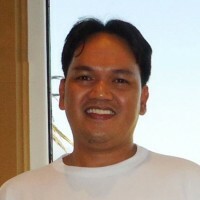 How did you start: Archel spent four years in marine studies after high school, and worked on a wide variety of ships including container vessels shipping cargo from Europe to the United States, passenger ships, and tugboats. Advice: Archel recommends taking every aspect of your job seriously and to strive for perfection. What do you do: As a deckhand, Sandra helps with various science operations such as deploying robotic vehicles and CTDs, as well as assisting with the day-to-day operation such as looking after lines used to moor the ship, and general ship maintenance. How did you start: At age 16, Sandra was determined to work on ships and study marine science. 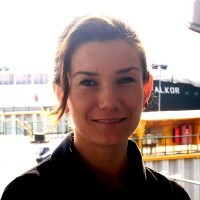 Sandra’s education in Poland focused on navigation and hydrographic surveys. Her first work experience was on a small tuna fishing trawler in the Baltic Sea. She has also worked on a passenger sailing ship that required climbing the rigging to set the sails. Advice: Don’t except any boundaries, and be willing to try something different. What do you do: Edwin works on everything from science instruments to ship parts, optimizing their fit and performance. 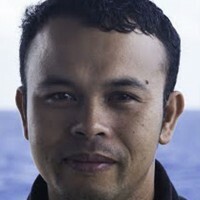 Edwin also does maintenance and repair, a never-ending job on a ship. How did you start: After high school, Edwin studied engineering at a technical school then worked on tankers that transported liquids for 10 years before joining Falkor. What do you do: Shiella attends to the living needs of crew, making sure the interior of Falkor is working and kept clean. 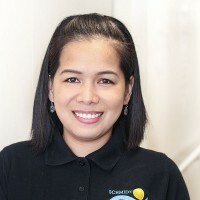 How did you start: Shiella graduated from college with a degree in Hotel and Restaurant Management. She worked in a five-star hotel, but wanted to see the world. After leaving the hotel, Sheilla worked on a cruise ship. Many people do not consider the fact that there are also hospitality careers at sea. 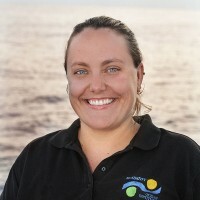 What do you do: Adriana works on the management side of the ship, organizing the science party that comes on and off, ordering supplies, and looks after general management of Falkor. How did you start: Adriana spent 10 years working as a computer engineer; however, adventure called. While working as a Business Analyst, Adriana met a woman who worked on a yacht. She first worked as a steward, then as the IT officer, and now is the purser on Falkor. What do you do: Colleen is responsible for the science department aboard the vessel, coordinating scientific operations, maintenance and use of shipboard science equipment, and the integration of new equipment. 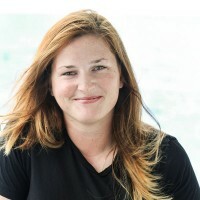 How did you start: Colleen attended a vocational aquaculture school during high school. It had a small research vessel, where the students conduct weekly labs and collected data for local organizations. This was Colleen’s first exposure to working on a ship, and she was immediately hooked. Colleen attended the Maine Maritime Academy and the first ship she worked on was the Black Pearl. Advice: Find an internship program to gain experience. For example, the Marine Advanced Technology Education (MATE) Center provides an education in marine science and small vessel operations that is a great foundation for becoming a marine technician. 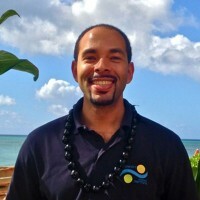 What do you do: Leonard manages Schmidt Ocean Institute’s annual collaborative proposal review process and related community coordination and outreach activities. He also manages special projects and liaising with the scientific community: for example, coordinating and leading SOI’s ROV Development Survey. 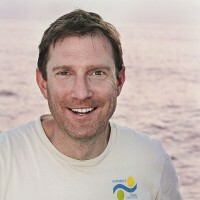 How did you start: From a young age Leonard was inspired to become a marine biologist. He majored in Marine and Environmental science in college and found passion during a semester at sea aboard S/V Westward. Leonard continued on to earn a Masters degree, which opened the door for his Knauss Marine Policy fellowship. Advice: Enjoy what you do.